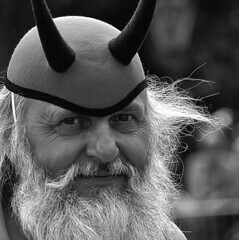 The Tour de France is all about control. Riders pre-ride key stages. Teams bring multiple spares for their protected riders, who have spent months tracking every calorie to make sure they're at their best race weight. So it's always revealing when the uncontrollable rears its head. For Saturday's Prologue, it was the weather that shook things up. Many riders with overall hopes opted for early starts to try to beat expected afternoon rains, but the rain started earlier than expected, and cleared before the last riders started, so the strategy seemingly backfired for some of the early starters. Not so for HTC-Columbia's Tony Martin, who was the 11th rider to start, and covered the 8.9-km course in 10:10, a time that wasn't even approached for more than three hours. Other outstanding performances early were Garmin-Transition's David Millar, in 10:20, Garmin's sprinter Tyler Farrar, whose 10:28 would place him 7th on the stage, and Sky's Geraint Thomas, who would wind up 5th on the stage. On the other hand, Sky's Bradley Wiggins, who was once a prologue specialist, rolled in with a 10:56, while former teammate Christian Vande Velde clocked in at 11:00 flat. For Wiggins, especially in a Tour with only one long TT, that's a worrying result. Organizers managed a very TV-friendly end to the Prologue, with Armstrong, Cancellara, and Contador leaving consecutively as the day's final riders. At the first time check, Armstrong was just 5 seconds slower than Martin. Less than a minute later, Cancellara would obliterate Martin's time, 6 seconds faster than the young German. When Contador came through, no one expected him to rival Cancellara, but could he match Armstrong? 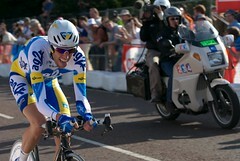 Contador was laboring even on the short stage, but at Time Check 1, he was just 1 second behind Armstrong. At the finish, Armstrong was a whisker slower than Millar, finishing in 10:22, with Cancellara closing. Spartacus would trip the guns at 10:00, leaving only Contador to finish, battling up the long final stretch. Contador would finish in 10:27, ceding 5 seconds to Armstrong, but making time on every other GC contender. And among GC contenders, perhaps the most disappointing ride was Andy Schleck's, newly crowned TT champion of Luxembourg, who finished in 11:09, and effectively summed it up on his Twitter feed. Nobody wins or loses the Tour in the prologue, but those small gaps over a short distance are a pretty good indicator of who has brought their best time trialing legs to the party, and more generally who is rocking the highest power-to-weight ratios in the peloton. First indication is that we might get the Armstrong vs. Contador battle that I'm sure Versus is hoping for. Eleven! Up from 6 last year, and it's largely a return of the “Lone Australian” phenomenon -- only HTC-Columbia, with Hansen, Renshaw, and Rogers has more than one Aussie on the squad. Every 2009 Aussie returns, and add Gerrans and Hansen, alternates last year, plus Roberts, Sulzberger, and perennial sprint threat McEwen. Eight is up from seven last year, and four in 2008. First-timer Bookwalter is here, Garmin's Danny Pate is not, and Chris Horner returns. The excellent showings of both Farrar and Bookwalter at today's prologue are great news for US cycling, which has a glut of over-30 Tour riders, essentially everybody else on the list above. Canada climbs from one to two, and long-suffering Michael Barry finally gets a Tour start at 34. Great Britain doubles up, with eight riders versus last year's four. Cavendish and Wiggins have dreams of winner's jerseys. Hayden Roulston wasn't invited by HTC-Columbia, Greg Henderson wasn't invited by Team Sky. Roche repeats as the only Irish rider. Up from an unusual zero last year. 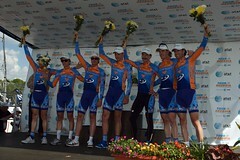 Garmin-Slipstream has announced their Tour squad. Martijn Maaskant has been announced as the alternate. NOT riding the Tour are Tom Danielson, who also missed out last year; Will Frischkorn, who made it last year; or Canadian TT champion Svein Tuft. Garmin's phenom Tyler Farrar will have one of the great lead-out men trying to put him in front of Mark Cavendish at the finish line, and Irish champion Dan Martin, nephew to 1987 Tour and Giro champ and world champion Stephen Roche, makes his first Tour start. It's a team with great TT riders: Zabriskie, Millar, Vande Velde, Pate, Wiggins, and Hesjedal. As with Farrar, you have to wonder if they'll be fast enough to take revenge on Columbia-High Road, which beat Garmin by six seconds at the Giro d'Italia team time trial in May. Team CSC has been the best-ranked team in the world for years, but has never taken the sport's biggest victory. Today, Carlos Sastre nailed down his first Grand Tour victory, and his team's first TdF win, with a 12th place in the longest time trial of the 2008 Tour. Gerolsteiner's Stefan Schumacher, who won the Stage 4 TT and has been active in attacks throughout the Tour, was the stage winner today, clocking a 1:03:50, again beating out world time trial champion Fabian Cancellara and Team Columbia's Kim Kirchen. Cadel Evans of Silence-Lotto, widely expected to put serious time into Sastre, was unable to gap the Spaniard. At each time check, Sastre trailed Evans by less than 30 seconds, and Evans would finish in an unspectacular 7th on the stage, in 1:05:56. Combined with Bernhard Kohl's 1:06:11, Evans will move up to 2nd, with Kohl falling to 3rd. Kirchen climbs to 8th overall, while Garmin-Chipotle's Christian Vande Velde moved into the Top 5 overall. Fränk Schleck had a rough day, finishing in 1:09:28 and getting caught by Sastre on the road, and falling to 6th overall. Schumacher takes the time trial! Classics specialist Stefan Schumacher of Gerolsteiner turned in a head-turning performance to dominate the Stage 4 time trial at the Tour. Schumacher was the only man to go under 36:00 on the day, finishing in 35:44. Team Columbia's Kim Kirchen just edged Garmin-Chipotle's David Millar, both in 36:02 to round out the stage podium. Among the overall GC threats, Cadel Evans had the best day, finishing 4th on the day in 36:11, better than world champion Fabian Cancellara, who finished in 36:18. Denis Menchov showed he's here to win, only 7 seconds slower than Evans, while riding from a very early start, without benefit of many time checks. Damian Cunego scored a 37:10, Alejandro Valverde a 37:18, while Carlos Sastre managed only a 37:27. Mauricio Soler, tipped by some as a longshot, must still be suffering from his accident on Stage 2, and was 161st on the day in 40:24, already 17:46 back of the race lead. Overall standings mirror the stage finish, with Schumacher taking the overall race lead. Columbia's Kirchen leads the green jersey competition, teammate Thomas Lövkvist leads in the white jersey competition, Thomas Voeckler holds the polka-dots, and Garmin-Chipotle extends its team competition lead, now leading Team Columbia. I always review the nationalities breakdown for the Tour, with a special eye toward the English-speaking countries. Here's last year's, for comparison. This is the least in years, with Freddie Rodriguez riding in the U.S., Bobby Julich not selected, Chris Horner and Levi Leipheimer barred with Astana, and David Zabriskie nursing a back injury. Baden Cooke is back; Adam Hansen, Trent Lowe, and Mark Renshaw are new, and Michael Rogers is out. Out are Geraint Thomas, Bradley Wiggins and Charlie Wegelius. I've got Christopher Froome as being from Kenya, which isn't in the list below. Put him there, and Great Britain drops to just a pair. First Canuck since 1997. Maybe Michael Barry will join him one year. Spanish representation drops from 42 riders last year to 30 this year, with France jumping from 35 to 40. David Millar finally has his Union Jack. Saunier Duval's Scotsman outfought breakaway companion Daniel Lloyd after the two dropped the field on the day's final lap. The British national championships, which (like other European championships) are usually held a few weeks before the Tour de France, were rescheduled because of torrential rain and flooding. Jonathan Vaughters, looking to win a 2008 Tour de France wildcard invitation for Team Slipstream, has confirmed three major signings for the 2008 season: Saunier Duval's David Millar and CSC's Dave Zabriskie and Christian Vande Velde. Vande Velde confirmed the signing during Sunday's VS. broadcast, while Millar apparently planned to announce the change during the rest day Saunier Duval press conference where Vinokourov's positive became public. The doping circus around this year's Tour would seem to only help Slipstream's chances. The team performs extensive longitudinal testing of each rider throughout the year, including blood profiling to discourage EPO use or blood transfusions. Very nice Flickr photo of Millar warming up in London by graspnext. Travel day yesterday, so I'm catching up tonight. Discovery Channel's Alberto Contador took an aggressive stage win as the Tour moves into the Pyrenees, and elevated himself from 1 of 10 candidates to win this year's Tour to one of the two favorites. Contador, just 24 and riding in the white jersey of the race's best-placed young rider, waited as teammate Yaroslav Popovych reduced the group riding with race leader Michael Rasmussen, then launched a blistering attack, initially answered by Rasmussen and Evans, that only Rasmussen could ultimately match. 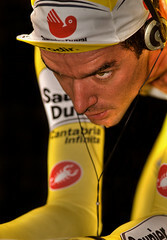 By doing so, Rasmussen moved one stage nearer a possible win in Paris, and Contador took his 1st career Tour stage win. Many of the pre-race favorites lost buckets of time today: Alexandre Vinokourov, who won on Saturday, lost 28:50 to Contador today. Christophe Moreau lost 34:52. Iban Mayo lost 9:31. A few riders managed to limit their losses to Rasmussen and Contador, who dominated the field today: Juan Mauricio Soler, riding in his 1st Tour, lost only 37 seconds; Levi Leipheimer and Carlos Sastre were close behind. Evans finished with Andreas Klöden at 1:52. Caisse d'Epargne's two leaders, Oscar Pereiro and Alejandro Valverde, finished together at 3:45. Possibly the dumbest move of the day came from Saunier Duval, which sent David Millar to set a fast pace few riders could match, only to find team leader Iban Mayo was among the riders who couldn't. 12) Mikel Astarloza, Euskaltel - Euskadi, Spain, s.t. 15) Haimar Zubeldia, Euskaltel-Euskadi, Spain, s.t. 16) Bernhard Kohl, Gerolsteiner, Austria, s.t. Major changes in the GC; Rasmussen gets a cushion on everyone but Contador. Britain's cycling development program has been quite successful, as the increase in British Tour riders from 0 in 2005 to 5 this year suggests. The head of British Cycling, the national cycling federation for Great Britain, says he thinks the program's success leads him to believe Britain will have an overall Tour contender within 10 years. “When we first started putting into place out structure I said it would be 20 years before we could have a Tour winner, but now I believe it will be within 10 years,” Cookson said. British Cycling's performance director, Dave Brailsford, is trying to find sponsorship for a British team. I think that Saturday's Prologue must be the most Flickr'ed sports event in history. With a million spectators viewing an event on public roads, there are at least hundreds of photos from the London Prologue posted on Flickr. And the growth of the digital SLR means that a lot of them are really good quality pictures. Graham Watson doesn't have to worry yet, but the pros can't provide the coverage that a million spectators can. Beautiful shot of Benoit Vaugrenard, who finished 10th Saturday. Tour de France, by One Del? Le Tour, by Simon Clayson, who caught the angry bike change by Mark Cavendish yesterday and the group towing eventual stage winner Robbie McEwen back to the field. Struck from behind while waiting for a crash to clear with about 20 kms/12.5 miles to ride, Robbie McEwen went over the bars, injuring his wrist. Adding insult, he then had to organize a chase to get back to the peloton, and only hooked back up with less than 5 miles to ride. But it apparently takes more than that to slow the fastest man on two wheels, who struck like lightning in the stage's last 200 meters, whipping the other sprinters' Canterbury tails. From at least 10 places back, McEwen catapulted past Tom Boonen and Thor Hushovd and won with a bike length to spare. It was McEwen's 12th career Tour stage win, ahead of Thor Hushovd and Tom Boonen. 3) Tom Boonen, Quick Step, Belgium, s.t. 4) Sebastien Chavanel, Française des Jeux, France, s.t. 3) Romain Feillu, Agritubel, France, s.t. 6) Robert Förster, Gerolsteiner, Germany, s.t. 7) Oscar Freire, Rabobank, Spain, s.t. 8) Marcus Burghardt, T-Mobile, Germany, s.t. 9) Francisco Ventoso, Saunier Duval-Prodir, s.t. 10) Tomas Vaitkus, Discovery Channel, Lithuania, s.t. McEwen said he landed on his knee, hand, and wrist in the fall. “At first, I couldn't bend my leg,” he said. “The guys rode like a team time trial to get me back in the bunch” for 13 or 15 kilometers, finally catching up in the last 5 miles of the stage. McEwen takes over the green jersey, David Millar takes the cheap King of the Mountains, and Vladimir Gusev holds the white jersey. There are 188 riders left, after Eduardo Gonzalo of Agritubel crashed through the rear window of a Caisse d'Epargne team car, and had to leave the race. Agritubel's Eduardo Gonzalo is the first man out of the 2007 Tour. He apparently touched wheels with someone and is out of the Tour almost before it's begun. David Millar is trying to make good on his promise yesterday to win a Tour stage, and he wants it as soon as possible: He was solo off the front earlier, and now is part of a 5-man group. He's taken maximum sprint points at 2 intermediate sprints. Also in the break are Andrey Grivko, Freddy Bichot, Stephane Auge, and Aleksandr Kuschynski. Millar has updated his rider diary over at Bicycling.com with his reaction to the Prologue. With less than 80 kilometers/50 miles to ride, the break is about 5:50 ahead of the peloton. CSC leads the chase, which is suddenly making some progress -- the gap is now 5:20. With 74 kms/45 miles to ride, the gap is down to 4:45.
Credit Agricole, Quick Step, and Predictor-Lotto have put riders on the front to reel in the 5 leaders, with less than 40 miles to ride, the gap has fallen below 3:00. Day's last intermediate sprint points go to Kuschynski (6), Bichot (4), and Grivko (2). The peloton rolls through 2:35 behind. Auge, Bichot and Kuschynski raise the pace, and Grivko and Millar can't hang, so the 5 are now 3 with less than a 2:00 advantage, and less than 30 miles/49kms to ride. Grivko and Millar are caught, and the gap hovers at 2:00. The sprinters' teams don't want to swallow the 3 breakaway riders too soon, which would just encourage another breakaway. On the other hand, David Millar leads the King of the Mountains competion, unless Freddy Bichot takes points at the final 4th-Category climb of the day, so Saunier Duval now is helping on the front of the peloton. Less than 24 miles/40kms to ride, and the gap is down to just over a minute. With 27k/17m to ride, Bichot and Kuschynski are caught, and Auge has increased the advantage to 27 seconds. Auge will take over the KoM jersey if he's first over the upcoming climb and Millar doesn't take points there. Augé does his part, but Millar is next across, so David Millar will wear the King of the Mountains jersey tomorrow. Augé is captured. Mark Cavendish and Robbie McEwen have been isolated by a crash or mechanicals. They're chasing along with about 20 other riders, with Quick Step driving the field and less than 10k to ride. McEwen has caught the back of the field, but it remains to be seen whether he can thread his way through the field and figure in the sprint. We're at 4 miles to ride. With 2 k to ride, Milram takes over from QuickStep, setting up 6-time green jersey Erik Zabel. Into the last kilometer, and Zabel, Bennati, and Boonen are up front. Now there goes Robbie Hunter of Barloworld, with a Discovery rider in his wake. He's building a good lead, but he's gone from way out, and as he fades, here comes Robbie McEwen, appearing out of the crowd as always, and he rockets to the win! Top Five was 1) McEwen, 2) Hushovd, 3) Boonen, 4) Sebastien Chavanel, 5) Feilleu. To follow my comments alongside the Tour broadcast, or to keep up in real-time, I recommend my Tour de France Twitter updates -- there's no RSS lag, and you can get updates direct to your mobile phone with SMS. Great Britain makes a great leap forward in its Tour participation, as the Grand Depart host, shut out in 2005, brings 5 riders to the 2007 Tour. US participation continues to slip, from 9 in Armstrong's final year to 6 this year. The Americans must have been two for a dollar, as three teams each have a pair of Yanks starting. This is down from eight in '06, as Landis awaits his hearing results and Bobby Julich was left home. Australia brings 6 riders, one more than actually started last year, with legitimate yellow and green jersey candidates. Lancaster won the freak 1150-meter prologue of the 2005 Giro, and makes his debut in the Tour. All the others started last year's Tour, and Allan Davis was on the ill-fated Astana-Würth squad. Thomas and Cavendish are two of the youngest riders in the race, while Wegelius makes his first Tour start after being a Giro fixture for years. Wiggins is primarily here for the Prologue, while Millar also has a chance in the Tour's longer time trials. The former Phonak has to be glad Alessandro Petacchi will miss the Tour. Spain leads the way among all countries, with 41 starters. France is close behind with 36. Riders from 25 different countries will start tomorrow in London. AG2R's Christophe Moreau took over the lead at the Dauphiné Libére with an attack into Saint Etienne, dedicated to his new daughter. With Aleksandr Kuschynski of Liquigas and Jerome Pineau of Bouygues Telecom off the front, Moreau launched a testing attack, saw it was working, and drew company in the form of Astana's Jose Redondo, Quick Step's Kevin Seeldrayers, Credit Agricole's Alexandre Botcharov, and Caisse d'Epargne's Xabier Zandio. Moreau, Seeldraeyers, and Redondo were the final survivors, and had about a minute with 20 kilometers to ride. At 7 km to go Seeldraeyers lost at least his chain, and the gap to the field was dropping. Redondo looked for a deal, but Moreau just kept powering toward the line, chasing a day in yellow. And it worked: Moreau, 36, took the stage, 33 seconds ahead of Alejandro Valverde leading in a group that included all the overall contenders. "it's going to be hard to maintain the yellow jersey after the time trial. The time I've gained today, I'll lose it tomorrow; it might be a good balance. My favourite terrain is switching slowly from time trialling to climbing. But I've showed today that my legs of an old man still work correctly. I haven't decided anything for my future. We must see how the old machine goes before calling it a career." No GC listing, because there still are 90 riders within a minute of the lead. Notably, three good US TT riders sit top 10: Levi Leipheimer, 4th at :25; George Hincapie, 6th at :27; and David Zabriskie, 8th at :27. David Millar sits 11th, at :30. Gerolsteiner's Heinrich Haussler leads the points classification, while Sylvain Chavanel holds the mountains jersey lead, and Moreau leads in the combination classification, for the rider ranked the lowest in all the jersey competitions. Great Britain's Bradley Wiggins, clearly focused on the London Tour prologue less than a month away, stormed the Dauphné Libéré prologue TT in Grenoble today. Wiggins edged Discovery Channel's Levi Leipheimer, the 2006 Dauphiné champion, and Astana's Andrey Kashechkin at the biggest tuneup for Tour contenders. Wiggins, with a long list of palmares on the track, takes the Dauphiné leader's jersey. Discovery Channel placed 3 riders in the top 10, with Leipheimer 2nd, George Hincapie 4th at :02, and Egoi Martinez 9th at :05. Caisse d'Epargne leader Alejandro Valverde was 5th on the day. Saunier Duval's David Millar, the other British hope for the prologue, was 11th on the day, at :06. Millar may have been slowed by wet roads that hampered earlier starters. A strong prologue (7th) has Tom Boonen well positioned to take over the race lead with a sprint bonus during the race's early stages. Astana's Paolo Savoldelli is the first leader of the Tour of Romandy/Tour de Romandie, after a 4:35.12 over a 3.5-kilometer time trial in Fribourg today. Savoldelli was 5 seconds faster than Czech rider Roman Kreuziger of Liquigas and 7 seconds faster than Predictor-Lotto's Chris Horner, of the United States. David Millar, fresh from a somewhat disappointing time trial at the Tour de Georgia, was 15 seconds back of Savoldelli, but he still is focused on the Tour de France prologue, where he hopes to take the yellow jersey in London. Defending champion Cadel Evans was 16th on the day, 14 seconds behind Savoldelli. Robbie McEwen brought up the ceremonial rear, 166th at 1:30 back. David Millar made it all the way back, with his biggest win since returning from an EPO suspension. Saunier-Duval's Scottish time trial specialist scorched the 4.7 km course in 6:01. CSC's Bobby Julich won the prologue last year, but was slightly slower this year, finishing 11th on the day, at 6 seconds. Roman Kreuzinger of Czechoslovakia, riding for Liquigas, was just a tick back of Millar, and a tick ahead of FdJ's Sebastian Joly to fill out the podium. Discovery Channel's Levi Leipheimer was 6th, 3 seconds behind Millar. 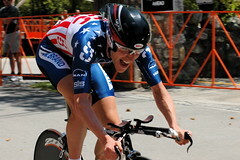 Dave Zabriskie was back in action after his accident at the Tour of California, finishing 40th, 14 seconds behind Millar. 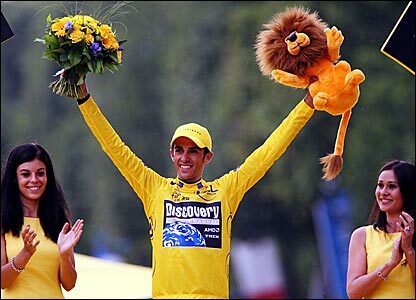 Discovery Channel's late signing, Alberto Contador, was 5th on the day. Scotland's David Millar, currently with Saunier Duval, escaped a possible jail term for his part in the Cofidis doping ring. A French prosecutor recommended that Millar and former Cofidis director Boguslaw Madejak not be jailed for their part in the team's doping between 2000 and 2003. Seven other defendants, including Philippe Gaumont, Massimiliano Lelli, and Robert Sassone still may face imprisonment for their role in the case. Prosecutor Jacques Hossaert recommended that the pharmacist accused of supplying the riders with EPO serve six months to a year in prison and a 3,000-euro fine. Early leader is once again Sebastian Lang, as in the prologue. He was the first man to go under 1:03, and leads Gustav Larsson and Joost Posthuma. Some times from riders of interest who have already ridden: Viatcheslav Ekimov 1:04:23; Chris Horner 1:05:57; Jens Voigt has the slowest yet at 1:11:44, suggesting he may have plans to go stage-hunting in the next couple of days. On the course now are Sandy Casar, Iban Mayo, Pietro Caucchioli, and Thomas Voeckler, among others. Casar came in 1:05:11; Mayo 1:07:20 -- that's got to hurt. Thomas Voeckler 1:05:47. Caucchioli in 1:08:21. Sastre, Leipheimer and Popovych are on the course. Julich is off. Sastre is the first one to shake things up; at the first time check, he comes in at 20:22, 5 seconds ahead of Lovkvist's time. Julich has crashed! He went down very hard at a left-right chicane, hitting the pavement and sliding into and over the curb. He's sitting by the side of the road, and may be the next casualty of the 2006 Tour. That's confirmed; Julich has been taken away in an ambulance. Liggett points out that the only other Tour Julich hasn't finished was because of an accident in the time trial, in 1999. Menchov hits the 1st time check in 20:07, best so far, 15 seconds better than Sastre. David Millar is out of the starthouse, slowly spinning up to speed. Leipheimer reportedly hit the 1st time check at 1:32 behind Menchov! That's 61st-fastest at that point, with a lot of riders to come. Cadel Evans is ready to roll, and he's off. T-Mobile's Eddy Mazzoleni is 2nd fastest through the 16.5 kilometer 1st check, 8 seconds slower than Menchov. Landis is in the start house on time, and he's off. His coach Robbie Ventura said they pre-raced the course at 75 percent this morning, and Landis likes his chances. Klöden comes through Time Check 1 at 19:58! Savoldelli is off; Hushovd is off; Hincapie awaits, looking solemn, and he's gone. Zabriskie is 4th at TC 1, 15 seconds behind Klöden. Menchov sets the new fastest time at the 2nd check, a fraction of a second ahead of Larsson. Michael Rogers is off, smelling yellow. Moreau hits TC1 at 25 seconds. Here goes McEwen, and Boonen is setting up in the start house, and he's off, last to leave as the yellow jersey. It's a full-on, Michael Rasmussen-style disaster for Leipheimer. He's already been passed by Christian Vande Velde, his 2-minute man. Landis reportedly had a bike swap. Sergei Honchar has come through TC1 at 19:37, setting a new benchmark. Landis hits TC1 in 19:54, 2nd best for now. Menchov finishes his ride fading, at 1:03:27. Zabriskie is 9th at the 2nd time check. There are reports the wind has picked up since the fast times this morning. Hincapie is 15th at the first time check, 52 seconds down on Honchar. Rogers is only slightly better, 46 seconds down on Honchar at TC 1. Vande Velde finishes in 1:04:57. Leipheimer is coming in, tripping the sensors in 1:07:49. What a nightmare for Leipheimer. Boonen is through the first time check (at 1:26), so Honchar's 19:37 is the fastest time there, followed by Landis at :17, Klöden at :22, Marcus Fothen at :29, and Denis Menchov at :30. Zabriskie hits TC3 39 seconds slower than Lang; Sergei Honcar sets the new best time at the 2nd time check in 43:50, just flying! Klöden is coming up to the line, and trips the clock in 1:03:26, 4th for now. Landis at TC2 is 44:32, 42 seconds slower than Honchar, but faster than everyone else so far. Zabriskie is finishing; he won't win the stage, and he finishes in 1:03:40. Hincapie at TC2: 45:53, slower than Ekimov and Savoldelli. David Millar hasn't factored in the intermediate checks at all, and finishes in 1:05:17. Christophe Moreau finishes close behind, in 1:03:47. Rogers comes to TC2 in 45:06, more than 30 seconds behind Landis. Honchar is fastest again at Time Check 3: 55:09 against Lang's previous-best 56:20. Honchar is roaring up to the finish; there he comes in 1:01:43! Landis is 57 seconds down at the 3rd time check on Honchar. He'll be finishing soon. Here he comes; he can't catch Honchar, but he's going to have a strong time, it's 1:02:44 for Landis. Honchar is almost guaranteed the stage win and the yellow jersey tonight. Savoldelli is coming into the last kilometer and brings home a 1:03:55. Hincapie is 23rd at the last time check, 2:32 off Honchar. Rogers comes through the last time check in 56:31, so he's coming in strong. Hincapie to the line in 1:04:25. Rogers catches Hushovd, his 6-minute man, just outside the 1-kilometer mark. He won't match Landis: 1:03:07 for the world TT champion. Boonen's taking his yellow jersey seriously; he caught McEwen on the road, and Boonen finishes his reign in 1:05:35, 41st on the day. McEwen closes out the day, in 1:08:10. Sergei Honchar has a stage win and a yellow jersey for T-Mobile! On rec.bicycles.racing, Ryan Cousineau is keeping track of the “Millar Line:” since Saunier Duval's David Millar is so loudly proclaiming that he's clean, anyone who finishes before him in a flat stage must therefore be doping, right? Sprinters are excepted, by decree. There's some very funny stuff in the related threads. Today, not so good: Millar Line Stage 3: They're all Guilty. Also from rec.bicycles.racing, here's Bob Martin's summary for Stage 3. Michael Rogers isn't a complete slouch in the mountains. He may make things interesting. Near the finish on Flickr: Kessler, Boogerd, Boonen, Freire, Bennati, then Totschnig (maybe Wegmann) and Rogers. Oskar van Rijswijk is back! He had closed down his weblog for June, but he'll be joining the party now. Oskar's got a very complete list of Tour and ProTour links that he's currently updating. PodiumCafe.com offers links to many of the rider diaries from around the web. I try to keep up with these, but it's a low-percentage play -- so many of them get updated before the prologue, and then sit idle for stage after stage. Of the listed diaries, O'Grady's was updated last night (understandable: he has a cracked vertebra), Leipheimer's is post-Prologue, Zabriskie's is from before the Tour, and Backstedt's was written before Stage 2. Maybe it's a team budget thing, because a notable exception is Discovery Channel, which presumably knows how to run a network: Chris Brewer makes sure they have more than daily updates on their fansite, including daily Liz Kreutz photo galleries (here's today's) at ThePaceline.com (free registration required): Where else can you find out that Discovery sports director Johan Bruyneel got Belgian fritjes (i.e. french fries) delivered to the team car today, Vincent Vega-style. They've also got daily Disco-centric updates on the team page, and an honest-to-God podcast. Matthias Kessler attacked over the Cauberg and kept his lead to the line, avenging his last second loss yesterday, earning T-Mobile probably its first bright spot of the 2006 Tour. Just 5 seconds behind, world time trial champion Michael Rogers led in a group of strongman sprinters and GC candidates. In 3rd on the day was Lampre's Daniele Bennati, ahead of world champion Tom Boonen, who had made no secret of his intent to take today's stage. He can take solace in the yellow jersey, the first ever for the 25-year-old world road champion, as Thor Hushovd came in 62nd, at 17 seconds back. He'll wear it in Belgium tomorrow, where he's a huge celebrity. Boonen also takes the lead in the green jersey competition as Robbie McEwen came in 34 seconds back in 89th. Lampre's Daniele Bennati, 4th on the day moves into 2nd in the points competition: Boonen 67, Bennati 66, McEwen 65, Hushovd 62, Zabel 59. This was a “declare your intentions” day for the GC; if you're not riding for the overall, why break your legs on the Cauberg? Floyd Landis, George Hincapie, Levi Leipheimer, Bobby Julich, Christian Vande Velde, Carlos Sastre, Paolo Savoldelli, Yarolav Popovych, Jose Azevedeo, Denis Menchov, Andreas Klöden, David Millar, Sergei Honchar, Cadel Evans, and even Gilberto Simoni all made the break to come in 5 seconds behind Kessler. Bookie favorite Alejandro Valverde crashed and broke his collarbone with about 20 kilometers to ride in an overlap of wheels -- a wide-open Tour de France is even more so this evening. Also out are Freddie Rodriguez and Erik Dekker, who went down together and were taken to a local hospital. Chris Horner came in 159th on the day, at 8:05. Stuart O'Grady rode in alone after an accident, 11:35 back, and Magnus Backstedt and Filippo Pozzato, 18:36 back, were the day's final finishers. 4) Tom Boonen, QuickStep, s.t. 5) Erik Zabel, Milram, s.t. 6) Luca Paolini, Liquigas, s.t. 8) Eddy Mazzoleni, T-Mobile, s.t. 9) Georg Totschnig, Gerolsteiner, s.t. 10) Fabian Wegmann, Gerolsteiner, s.t. Thor Hushovd will wear yellow for at least a couple of days, after an astounding ride at the Tour prologue in Strasbourg. Hushovd is an annual combatant in the sprinter's jersey competition, which he won last year, but is more a pure power rider than some of the other sprinters (Robbie McEwen, I'm looking at you). He should be able to stay close enough to the sprinters over the next few stages to hold the overall race lead. He edged out Discovery Channel's George Hincapie and CSC's Dave Zabriskie, with Sebastian Lang 4th and Spain's Alejandro Valverde 5th. Phonak's Floyd Landis missed his start time, and lost nearly 10 seconds before his Tour even started. His 9th place at 8:26.26 would certainly have bettered Zabriskie, and would have rivalled Hincapie and Hushovd if he had ridden the same ride with an on-time start. OLN reports Landis had a flat tire as he came to the start. David Millar, returning from a 2-year suspension for EPO, could manage only 17th, in 8:31.65. This story doesn't really seem to capture the whole moment. Time to stop the gossip and start the racing. Today's prologue is dead flat, 7.1 kilometers or almost 4.5 miles. It's a loop course around downtown Strasbourg. CSC's David Zabriskie is the consensus favorite, and he took an even shorter prologue at the Dauphiné Libéré. Other riders to watch are David Millar, coming back very motivated from a 2-year ban for EPO, and Brad Wiggins, who way back in April told the BBC this was his stage. Live coverage on OLN starts at 8:30 a.m. Eastern. On the web, you can choose from CyclingNews.com, VeloNews, BBC, Eurosport, Daily Peloton, or me for updates. From the official website, you can follow intermediate time checks, the stage newsflashes, and the current stage standings. Since most of my readership comes from English speaking countries, I thought I would post a quick roundup of which (and how many) citizens of the former colonies are scheduled to ride in this year's Tour. Last year, all of these plus Lance Armstrong and Trenti, but minus Vande Velde. Last year, Australia had all these, plus Baden Cooke, Brad McGee, Luke Roberts, and Matthew White. Great Britain was shut out last year. None last year, although Dean rode in 2004. Plus permission to root for David Canada. The last Canadian in the Tour was Gord Fraser in 1997, but Ryder Hesjedal or Barry should break that streak soon. Bradley Wiggins has made his pick for the 2006 Tour prologue in Strasbourg, and it's ... Bradley Wiggins. That would include 2005 “non-prologue” winner David Zabriskie of CSC, 2004 prologue winner Fabian Cancellara, and 2000 prologue winner David Millar, who will be returning to racing after a 2-year doping ban.